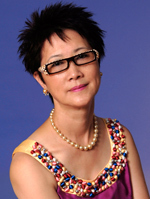 Iris Cheng - President and founder of The Music Association of Auckland in 2002. Advisory Board & Honorary member of Auckland Philharmonia Orchestra since 2003, Chief Adjudicator of Auckland Chinese singing competition events, Co-Chair of Yellow River Cantata with Manukau Symphony Orchestra - 2009, an active music promoter in the Chinese community, coordinating with professional musicians to perform in NZ from Hong Kong and China, supported by the Auckland Museum, Ministry of Culture PR China, Confucius Institute, NZ Arts Festival and Hong Kong Economic and Trade Office. Iris is a trained soprano, she has over 35 years of experience in choral singing and winner of Hong Kong TVB/Sharp singing competition in 1975. Fang Ni – Music Director & Conductor of The Music Association of Auckland. Bachelor degree majoring in vocal Music with Professor Pian Bing Xin. Participated in the International Olympic choral master class, have been working in music education and choral conducting for a long time. She has been Committee member and vocal leader with some choirs in Xiamen. Participated in many international and domestic competition performances. Youth choir rehearsal conductor and adult choirs have achieved good results. She has been seconded to Xiamen Song and Dance Troupe to perform “Ami Girls” Opera in Beijing and Guangzhou. 30 years of artistic practice on choral art with good understanding and experiences. Maritza Cáceres – MAA Adviser, holds a Bachelor’s degree in Music Theory from the University of Chile and a Master’s degree in Choral Conducting from Westminster Choir College in Princeton, New Jersey. She began her doctoral studies at University of Illinois, Champaign-Urbana and is currently a DMA choral conducting candidate at TCU. Mrs. Caceres has been conducting church choirs, children, community, symphonic, youth and women choirs in her native Chile, New Zealand and USA for the past 30 years. Her teachers have been Dr. Joseph Flummerfelt, Dr. Fred Stoltfuz, Helmut Rilling, Ron Shirey, Dr. Eph Ely and Dr. Dennis Shrock. As a chorister of Westminster Choir College she sang under the direction of Ricardo Muti, Zubin Mehta, Robert Shaw and Kurt Mazur among others. She sang with Westminster Choir at the Spoleto Festival in Charleston, South Carolina, and Festival dei due Mondi in Spoleto, Italy. She has collaborated with her husband Miguel Harth-Bedoya with Auckland Philarmonia and Fort Worth Symphony in preparing Beethoven’s Ninth Symphony, I Pagliacci, Magic Flute Choruses,Chichester Psalms, CarminaBurana and “Elijah”. She also gave conducting master classes to 45 Music Educators in Chile for the program “CrecerCantando”. Mrs. Cáceres has also served on the Youth orchestra of Fort Worth as a board member and chamber music coach. Maritza lives in Fort Worth with her husband Miguel Harth-Bedoya and their three children, Elena, Emilio and Elisa. 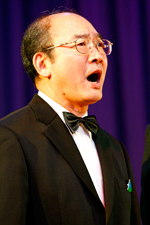 Johnson Kwok – Tenor. One of the founding members of MAA, choir supervisor and Tenor Leader. He was lead tenor in Hong Kong Chang Feng Chorus and has sung in the Hong Kong Arts Festival and Asian Arts Festival. After migrating to New Zealand, he has been actively performing with the Auckland Bel Canto Choir, Rainbow Choir and Show West Singers. Johnson has studied vocal music with Duncan Zhang and James Meng. He is the understudy for “An antiphonal Duet at the Riverside” in 2009 Yellow River Cantata with MAA and Manukau Symphony Orchestra. John Yeh - Tenor. MAA Tenor leader. A well-known tenor soloist from Taiwan and one of the founding members of MAA, he has over 30 years of experience in choral and solo singing and has studied vocal music in New Zealand with Mr. Jiang JiaQiang. He is the understudy for “An antiphonal Duet at the Riverside” in the 2009 Yellow River Cantata with MAA and Manukau Symphony Orchestra. 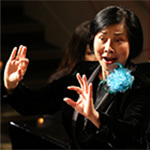 Vicki Cen – Soprano. Bachelor of Music, Xinghai Conservatory of Music. She holds a Bachelor Degree in Arts (Music) from Xinghai Conservatory of Music in China in 1998, has more than fifteen years experience in singing & chorus. She has been helping with translation work in MAA. Maggie Ding – Soprano. Capital Teachers University, Beijing A graduate of vocal music from the Music Department, Capital Teachers University and has been engaged in teaching vocal music and piano in China and Auckland. Maggie has been a soloist in China Peace Theatrical Troupe, a prizewinner of the All-China Singers’ TV competition and having organized as well as performed in numerous arts festivals in China. 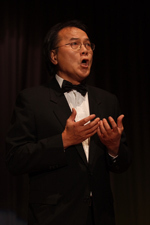 Alan Qiu – Baritone. Bachelor of Music major in vocal singing, graduated from Zhanjiang Normal University of Music in China. He won numerous prizes at competitions in other Chinese domestic provinces and cities. He has won the 1st prize of 2010 China Jiangxi Red Song contest – New Zealand Division. He is a baritone soloist and member of MAA in Auckland. Mary Mitchelson – Soprano. She was a pupil of Dame Sister Mary Leo for 13 years. She studied with Francis Wilson and resumed her singing career in 1990. In 1991 she was soprano soloist in the Bach Magnificat presented by Cantus Firmus and Extempore Plus. In the same year she joined the Auckland Opera. In 1991 she performed in “La Boheme” with Dame Kiri Te Kanawa. In 1992 she performed with Dame Malvina Major in “New Zealanders at Aotea” and in 1993 she performed with Noel Mangin in Auckland Opera’s “Tower Opera Concert”. Now a lady at leisure, singing at weddings and concerts.